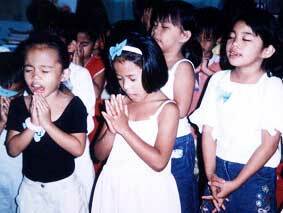 500 CHILDREN PRAY AT BLC’S VACATION BIBLE SCHOOL BETWEEN SUMMER SCHOOL AND THE 2006-’07 SCHOOL YEAR. Freeing destitute parents from the impossible task of finding money for their kids’ schooling is one of our goals in the BLC sponsorship program. This gives them freedom to find jobs and provide for their families’ needs. This year, 6 students “graduated” from the sponsorship program, as their families said they could now pay for their own tuition. Praise God! “Pastor Paul, thank you for the free education of my daughter. At this time, We want to give that sponsorship slot to another kid. I have been praying for this for a long time and God has answered our prayers! “My daughter Angel will still be in BLC, but now, praise God, we can pay her way. Please now give another family the same wonderful opportunity that you have given us. Thank you again, and God bless you! DURING VBS, MANY BLC KIDS BROUGHT THEIR UNSAVED FRIENDS TO LEARN ABOUT JESUS. Since 2003, I have been enrolled in the Master’s Sociology program at Ateneo University. This Spring I passed my last class with an overall GPA of 92.5%. The last 2 requirements are our comprehensive exams and our theses. My classmates and I introduced a new format for the exam, and it was accepted, on the condition that we present it and our reports to the entire faculty and student body of the graduate school! Being a “mini-thesis,” I chose to present the item of greatest importance to humanity, man’s preparedness for “FATAH” (Favorable Access To the Afterlife in Heaven). Placed in the Mindanao setting, all 4 religious persuasions (Lumads, Muslims, Catholics and Protestants) must evaluate their “FATAH” beliefs. By accepting Jesus, the “Age of Empowerment” will begin. Callem Betil, grandson of one of the first converts in this area of Mindanao, is an ordained minister. In 2005 he agreed to pastor our church plant in Panantungan. The congregation of 65 there is extremely poor, so their income does not cover the pastor’s expenses. Elvie and I prayed with the Betils about their problem. We decided to hire him at BLC. He was so thrilled! Presently his wife is the discipleship coordinator at BLC for the women. As a result, the moms in the church greatly outnumber the dads. Callem will now disciple the men. In his first 3 days of work here, he has already prayed with two dads who decided to receive Jesus into their hearts! Our long-range plans with the Betils include team-pastoring our growing number of church plants by training these new believers to grow in Jesus and become lay pastors themselves. WE FED THE PASTORS WHO HAD A RALLY AT BLC. THEIR FOOD WAS ON PLATES COVERED WITH BANANA LEAVES. You cover plates with banana leaves to avoid washing.